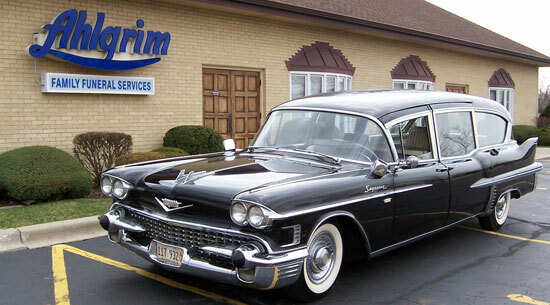 This 1958 Cadillac DeVille, customized by Superior, was found on a used car lot on Rand Road. With a little work by Mr. Doug Ahlgrim and Mr. John Mark the vehicle became a symbol of tradition and love of the past. This is shown by the Ahlgrim Family every day as they run their four generation business. Its past before 1989 has eluded us. Only a few bits and pieces have come to light. Very early in life the vehicle was a combo unit in Michigan. This means it pulled double duty as an ambulance as well as a hearse. How exactly it got from Michigan to Illinois is a mystery. Since the vehicle found Mr. Ahlgrim, it has had more then a few stories rumored about its exploits. “The Women of Brewster Place” Staring Oprah Winfrey, 1989 March 19-20, Miniseries – The hearse can be found in the first and second episode. “Only the Lonely” Staring the Late John Candy and Alley Sheedy, 1991 Theater Movie (filmed in 1990) – The hearse can be found all throughout the movie parked outside the funeral home. Fun Fact: Sandra Ahlgrim, Wife of Douglas Ahlgrim, is asleep across the front seat during the scene when John Candy is in the bucket of the Fire truck outside Alley Sheedy’s second story window. FYI — Mr. Douglas R. Ahlgrim was in the television series called “The Human Factor” If we remember right he is seen at the end of the first episode loading a casket into his 1977 grey 3-way hearse. In all its fame the 1958 caddy still finds time to perform its primary duty of proud transportation of a life in celebration. Besides some very special funerals, this hearse drove a newly wedded couple from their church to their Reception. In the early 90’s the hearse had frequented many haunted houses in the surrounding communities. Most of the season it found a home watching over the Lake Zurich Haunted House. Each year the “Barn” in Lake Zurich is allow to be taken over by the ghosts and demons of Lake Zurich’s past. The Cadillac has been heard cruising Cuba Road the days before Halloween. This rumor has not been confirmed. This vehicle is a part of the American History “They don’t make them like this anymore!” Not only do we appreciate the craftsmanship and beauty of the model but it also gives us a smile. In this business we are reminded every second of every day that we need to take time to enjoy life.